Burning Desire Video Slot Review - Casino Answers! Burning Desire is a 5-reel, 243-way video slot developed by Microgaming, featuring a wild symbol, scatter wins, multipliers, a free spins feature and a gamble feature. You can play the Burning Desire video slot at Bovada. Burning Desire is a quarter slot. Coin sizes on the Burning Desire slot machine are $0.01, $0.02, $0.05, $0.10, $0.20, $0.25, $0.50 and $1. You can bet 1-10 coins per spin. You can bet anywhere from $0.25 up to the maximum total bet of $250 per spin. Burning Desire has a very good betting range that is suitable for most online slots players. To play the Burning Desire casino game, select your bet and press the “Spin” or “Bet Max” button. The top-paying symbol is the Diamond symbol. If you land 5 adjacent Diamond symbols, you will win the 3000 coin top jackpot. Other high paying symbols on the Burning Desire slot game are the Seven (2000 coins) and Bell (1500 coins) symbols. You can win these top payouts by playing the Burning Desire online slot at Bovada. Burning Desire’s wild symbol is the Logo symbol. The Logo symbol will substitute for all symbols except for the Scattered Coin. The wild symbol only appears on reels 2 and 4. The Coin is the scatter symbol on the Burning Desire video slot. You can get a scatter win by landing just two Scattered Coin symbols or you can win 100X your total bet by hitting five. Three or more Scattered Coin symbols will win you 15 free spins at a 3X multiplier. All free spins feature wins are tripled. Free spins can be re-triggered. The number of coins that triggered the feature are carried through into the free spins feature. You can win up to 90,000 coins during the free spins feature! Only highest win is paid per way. All wins pay left to right, except for scatter wins (which pay any). Wins are multiplied by coins per way. Wins multiplied by the total bet. You can view the symbol’s payout quickly by clicking on the symbol when it appears on the reels. Burning Desire has an autoplay feature with advanced settings. To use the autoplay mode on the Burning Desire online slot machine, you must hit the “Expert” button. You can now play 5 or 10 autoplay spins. For advanced settings, hit the “AutoPlay” button and you can now play 5, 10, 25, 50, 100, 250 or 500 autoplay spins and stop autoplay if a win exceeds or equals $100, $500, $1000, $5000 or $9999. Autoplay will stop on any feature contained in the game. You can stop autoplay at any time on the Burning Desire slot game. Burning Desire is a solid 243-way slot game with a few special features and some decent payouts. 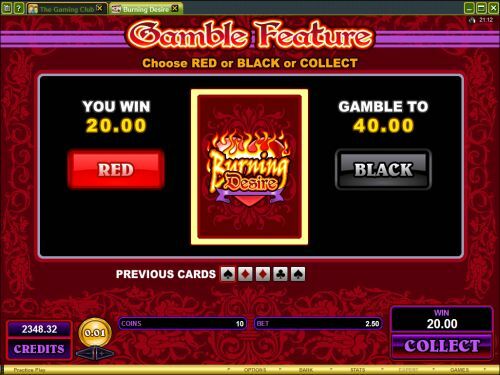 If you’re got a burning desire to play a video slot that fits that description, you can play the Burning Desire online slot game at Bovada. Can USA players play the Burning Desire video slot for real money? No, but you can play some excellent USA-friendly video slots over at Slotland Casino. Where can I read more 243-way video slot reviews? To read more all ways video slot reviews, please check out our complete list of all ways slots.